Czech-English – 78 664 entries. This dictionary is powered by Millennium dictionary databases. Millennium is one of the leaders in the field of quality language translation software and the maker of popular Millennium Czech dictionaries. 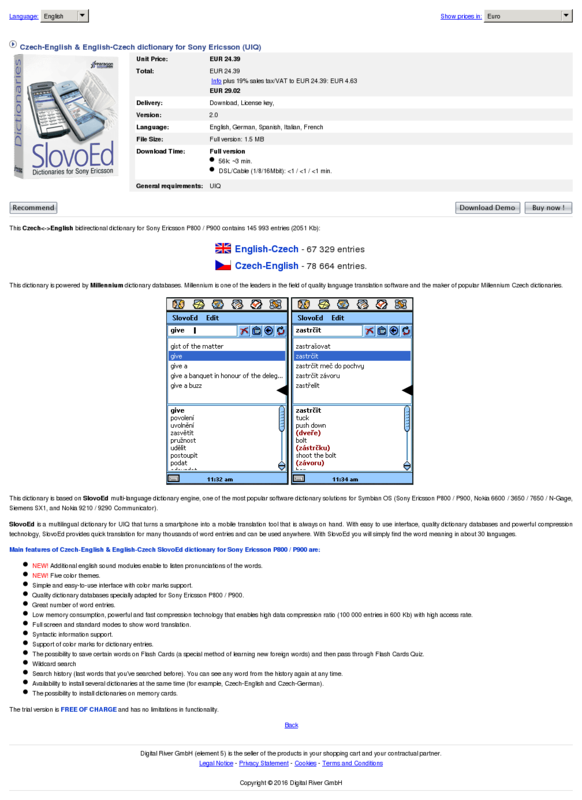 This dictionary is based on SlovoEd multi-language dictionary engine, one of the most popular software dictionary solutions for Symbian OS (Sony Ericsson P800 / P900, Nokia 6600 / 3650 / 7650 / N-Gage, Siemens SX1, and Nokia 9210 / 9290 Communicator). SlovoEd is a multilingual dictionary for UIQ that turns a smartphone into a mobile translation tool that is always on hand. With easy to use interface, quality dictionary databases and powerful compression technology, SlovoEd provides quick translation for many thousands of word entries and can be used anywhere. With SlovoEd you will simply find the word meaning in about 30 languages. NEW! Additional english sound modules enable to listen pronunciations of the words. Simple and easy-to-use interface with color marks support. Quality dictionary databases specially adapted for Sony Ericsson P800 / P900. Great number of word entries. Low memory consumption, powerful and fast compression technology that enables high data compression ratio (100 000 entries in 600 Kb) with high access rate. Full screen and standard modes to show word translation. Support of color marks for dictionary entries. The possibility to save certain words on Flash Cards (a special method of learning new foreign words) and then pass through Flash Cards Quiz. Search history (last words that you’ve searched before). You can see any word from the history again at any time. Availability to install several dictionaries at the same time (for example, Czech-English and Czech-German). The possibility to install dictionaries on memory cards. The trial version is FREE OF CHARGE and has no limitations in functionality.